A parade brings good tidings to an immigrant community beset by war, poverty, and illness. Thanksgiving morning on the Lower East Side is a special day for a white immigrant girl named Loretta “Rettie” Stanowski. 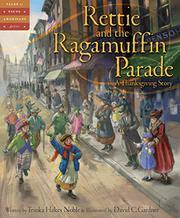 It’s the day of the Ragamuffin Parade, when children dress in rags and collect pennies thrown at them. Nine-year-old Rettie, blonde and rosy-cheeked, needs those pennies because she is the head of her family. Papa is fighting in Europe in the closing days of World War I, and Mama is sick in bed with consumption. Rettie’s little siblings are hungry. Complicating matters in the neighborhood are the quarantine signs for the influenza pandemic. Despite all this, Rettie rises to the occasion, receiving compliments from a visiting nurse as she cleans, prepares food, and teaches her little sisters and brother their school lessons. All ends well as the fighting stops, Mama regains her health, and the flu scare abates. Pumpkins and apples adorn the tenement apartment as “a young girl’s heart is filled with the hope of Thanksgiving.” Noble’s tale of parades and tenement life positively brims to overflowing with good cheer, culminating on Thanksgiving Day 1918. Gardner’s full-color illustrations depict a bustling community where good spirits overcome bad happenings.